This short story is intended to provide an intuition pump, rather than a formal argument. The intuitions unleashed may help some people to conceive of a world in which consciousness research enabled the creation of a world-wide long-term peace. Enduring peace for the eons to come, incredibly, thanks to a relatively small number of people taking a hard look at the available state-space of consciousness. We now have a wealth of hints and leads for larger-than-life experiences. There are many modes of first person subjective experience. But it has taken us a long time to systematize the study of non-ordinary states of consciousness. References to specific chemical agents should not be taken to mean that this is how the project would necessarily go. This is a hypothetical scenario. Use the substances as a guide that point at remarkably specific, but accessible, varieties of qualia. We are somewhere in the 2050-2200 time range. Consciousness research has gained popularity among scientists of many disciplines. People are excited to see new technologies that induce a variety of subtle yet helpful states of consciousness. Schools benefit from the development of tDCS, doctors take a variant of hydrafinil to use predictive Bayesian networks to make diagnoses, and couples therapy uses a safe ultrasound stimulation that enhances empathy. However, these technologies tap into states of consciousness that people are familiar with. This facilitates their adoption since people are not alarmed by the novelty. But staying in known territory constrains the search space to an unreasonable extent. Even though consciousness research is widespread, there are only a few hubs of exceptionally good researchers who work on these problems full time. There are roughly three schools of thought here. We call them large consciousness research hubs. The first kind only has people who do one activity. The Super-Shulgin Academy is one example of this school of thought. The second kind divides its researchers into those who perform consciousness exploration themselves and those who stay as perennially sober researchers and focus on objective third-person measurements. The main problem that usually arises with this setup is that the sober side does not give much credibility to the value of the experiences of the explorers. They simply lack an adequate evidential base from which to judge. The third kind has an organizational design substantially more elaborate, which divides the cognitive roles into overlapping, yet specialized roles. This school of thought is called the Qualia Computing Approach, and its main principle is to measure the formal, subjective, and computational properties of every possible state of consciousness. The organization was optimized to do just that. It was first invented in order to meet the demands placed on it by the mission of the Manhattan Project of Consciousness. The research center known as the Bienavi Institute (from the Spanish Bien-good, and the French vie-Life) was the first to fully embrace the Qualia Computing Approach. The institute hosted, funded and provided the human needs for a total of 400 researchers. These researchers are divided into 10 research units, each with 40 personnel. Each unit is a combination of several modules with specialized functions; we can call these role clusters. There is no fixed number of researchers for each of these role clusters; each research unit gets the flexibility to choose their role distribution (based on their past history of successes and the nature of their current goals). The approach encourages researchers to jump from role to role until they are satisfied with one that truly fits them. If necessary, they can create custom roles (as long as they can argue in their favor). As a general tendency, though, each unit has a role distribution that is fairly typical; organizational structure convergence across research units is expected. The Turing-Hofstadter-Yudkowsky (Turing, for short) module is responsible for computing, modeling, selecting experiments, and providing algorithmic analysis and design. People in this module are often statisticians, computer scientists, psychologists, and/or rationalists. They are people trained in the art of inventing, programming, and computing with made-up symbolic systems. Researchers in this module do not need to have extensive experience with non-ordinary states of consciousness, but they do have to be acquainted with them, since this is necessary to be able to interact with researchers in other modules effectively. Come up with new psychophysical tools to investigate the computational properties of novel states of consciousness. Test computational and algorithmic models that try to account for the information-processing behavior that consciousness displays in different states. Mine the computational properties detected in the qualia already explored to program new symbolic systems capable of performing efficient computations (by taking advantage of the properties of consciousness). Turing analyzes the information coming from the other consciousness researchers in order to characterize the convenient properties of consciousness and to develop new applications with it. Turing quantifies these properties, and investigates their computational bounds. Its final goal is to have the best possible models of both the properties and the applications of all states of consciousness. The Shulgin module focuses on developing a scholastic breadth of knowledge and firsthand experience of the state-space of consciousness. So-called Shulgins (the people who work in a Shulgin module) have a persistent curiosity about what there is yet to be discovered in the terra incognita of the psyche. Shulgins explore a given compound, technique, combination of neural stimuli, set of epigenetic modifications, etc. for a time that ranges from a week to a month. They comprehensively catalogue its subjective properties and note any commonalities with previously experienced states of consciousness. If they encounter peculiar phenomena, they explore it a handful of times in full, but then move on. Even though they know of unfathomable experiential paradises, their sight is fixed forward; they are constantly looking for new methods of mind-altering, and will never stop looking, no matter how seductive previous experiences may be. People in this module need to be (1) very psychologically robust, (2) possess exceptional memory, (3) outstandingly skillful in navigating consciousness, (4) compassionate, (5) tremendously curious, (6) masters of delayed gratification, and (7) cautious. The Lilly-McKenna-Leary module focuses on depth rather than breadth. Like Shulgins, they experience a large number of states of consciousness with fascinating properties. However, they do so with an eye towards exploring particular phenomena to their ultimate effects. It is often the case that the regions that Lillys explore are first discovered by a Shulgin and then studied by a Turing before they are promoted as an interesting area of research for Lillys to pick up. People in this module share all of the requirements that Shulgins have, except that the bar for navigational skills is a tad higher, and the need for cautiousness is smaller. In fact, some degree of irrational bravery is ideal for this role. Without it, Lillys would not take the plunge and explore alien ontologies that make you feel like you will never return to sanity again. As do people in all modules, Lillys go to work with a rational mindset and a scientific outlook towards their duties. That said, Lillys are unquestionably the people who are closest to the edge of knowledge. Their firsthand experience with profoundly outlandish varieties of consciousness tends to give them a sense of perspective rarely seen among humans. During an experiment with his wife, both Shulgin and Ann started to experience a profound time dilation. They were both concentrating on a clock, and it seemed to be slowing down progressively. When Sasha realized that this dilation was heading asymptotically towards infinity, he panicked. He was afraid that if time stopped, no one would be able to unstop it. He decided to distract himself, and avoid this asymptote. As Ann describes it, he “chickened out.” What this story illustrates is Shulgin’s cautious approach to particularly weird phenomena. If he took the risk of following the weirdness to its ultimate implication, he would be compromising the continuation of his investigations. When the McKenna brothers were experiencing a voice in their heads on a high dose of psilocybin, they did everything possible to amplify it. The end result was the phenomenological conviction of mind-melding with extraterrestrial intelligences, and in turn becoming part of the entire cosmos. It caused a temporary psychosis that Dennis McKenna had to endure, and Terrence take care of, for several days. What this story illustrates is how Lillys go full-on in one direction if they are convinced (whether right or wrong) that there are profound landscapes in the state-spaces they are headed towards. They are willing to get lost in the off-chance that they find the phenomenological equivalent of Shambala. James–Pearce–Goethe (James for short): This module is populated by researchers who are trying to integrate the discoveries made by Turing, Shulgin and Lilly into a unified science of qualia. They are people with outstanding Philosophical Quotients who can switch between interpretative cognitive styles (e.g. empathizing vs. systematizing). They try to make sense of philosophy in the context of consciousness research, and to investigate possible ontologies that may bridge the gap between theoretical physics and cognitive science. Everett-Maxwell: These are physicists trained in both theoretical physics and dynamical systems. They take into account the models developed by Turing, and try to find natural physical isomorphisms. These two last modules work together closely: Everett makes sure that the work of James is mathematically and conceptually sound, while the James module guarantees the philosophical adequacy of the interpretations of Everett’s models. These two modules are not always present, but they are required for certain kinds of investigations. In particular, they were crucial in the development of the kinetic energy theory of angry strings. The first program, Unity, was started as an attempt to create phenomenal bridges between the experience of universal oneness and everyday states of consciousness. The purpose of this program was to find a phenomenological technology to address core causes for the failure of cooperation in human societies. Nuclear war, among other disappointments, had shown that neither hegemony nor Mutually Assured Destruction could prevent substantial human conflict in the long term. A paradigm shift was needed. Ample empirical data showing that both the base-rate of mystical experiences and the presence of a culture of rationality were the best predictors of sustainable cooperation between groups of humans. Starting off with these leads, the Bienavi Institute decided to research therapies to increase both of these predictors simultaneously. There were many psychic layers to overcome. People’s self-representation occurs in parallel through many channels. Just as we have a modality for touch, sight, smell, etc., we also have a modality for each of our self-models. The difference between them is, to put it bluntly, the quality and structure of their respective survival programs. We have (1) a physical bodily representation of oneself, (2) emotional inclinations, (3) intellectual identifications, (4) narrative embeddings, and (5) ontological conceptions. There are other self-identifications, but these are some of the major ones. When the identification with any one of these programs as oneself is made, it begins to accumulate a gloss of ontological qualia. Ontological qualia provides the deepest experiential context. We could say that one’s experiences are but paint in a large void impregnated with positive ontological qualia. Experiences unfold, but they rarely affect the underlying quality of being very much. Ontological qualia provides the sense of reality that grounds other qualia in a background of happening. Identifying oneself with one’s physical body, emotional attitudes, etc. makes these representations seem truly real and necessary for survival. By locally binding ontological qualia to any self-representation, one adds psychological weight to the continuation of its existence. A trivial example is the cached selves effect: emotionally identifying with one’s verbal statements subtly redefines one’s self-representation as essentially interwoven with the reinforced programs. In practice, this causes the difficulties that arise with being unable to let go of structures and models one has exercised before. The pain of separation. Evolution has recruited one of its orientable positive manifolds to represent what we call realism. When you nod, when you think about what is trivial, when you get a new interesting idea, your experiential field receives a hefty dose of positive ontological qualia. It feels real, present, noteworthy. Your lifeworld is full of hints of a wider reality. A feeling that there is something real to pursue. Disappointment, loneliness, confusion are all impregnated with low-level negative orientable manifolds in the experiential field. They release energy that is not ready to die. Non-orientable manifolds provide a sense of timelessness. For example: during youth, math is typically perceived with outstanding realism. It sparks a feeling of presence. However, the cognitive activity of “doing math” gradually becomes populated with non-orientable ontological qualia as a person matures mathematically. Rather than perceiving mathematical ideas as living presences, they see them as timeless and expressionless patterns. In its extreme form, realism can spark spiritual experiences, which are the result of saturated feelings of being in one’s experiential field. Being overflows one’s sense of time and space, and one experiences an ontologically solid absolute necessity. Depression, on the other hand, could be described as a low density of realism with an awareness of this absence. However, even in bad emotional states, ontological qualia is still on the whole typically positive. One’s object of interest may feel unattainable, but one’s feeling of the existence of this problem is full of realism. Without positive ontological qualia, the mind is not able to believe that there is anything at stake in the game. Even though we don’t normally realize it, we have a constant and robust continuous stream of positive ontological qualia in our experiential field. Intuitively we believe that what feels most alive is centered around our senses. And while we do have the ability to turn on our senses’ realism very strongly, what usually has the most realism is our sense of presence as narratives. Our sensory modalities are not the place in which this realism is expressed the most. In humans, there is a typical hyper-expression of the realism of their social logico-linguistic selves. Coincidentally, a vast proportion of human conflict can be tracked to excessive identification with one’s self as a collective, yet narrow, narrative. This is compounded with a strong, yet naïve, omnipresent phenomenology of realism associated to one’s own experiences. Race, origin, ideology, sexual orientation, self-intimacy, etc. are not intrinsically problematic axes of human variability. But in practice they limit human cooperation dramatically. Even if only a small fraction of people take these differences seriously, it still has the effect of setting the values of Schelling fences in confrontation against the out-group. These differences only matter because of the intuitive, yet metaphysically false, self-identification with one’s particular local context. A key technology without which the research program might have produced psychological casualties was a method capable of resetting one’s consciousness. A chemical switch was created that combined two undisclosed brain-modification technologies to lower the overall free energy in one’s experiential field. This reset button guaranteed that participants could come back to consensus reality quickly, and in this way abandon problematic state-spaces. The technology also helped them forget about these experiences on a meta-cognitive level. Additionally, with the help of ultrasound stimulation, participants could neutralize their hedonic tone whenever they felt the need to do so. Bad trips could be avoided with this method. The experience of universal unity was found to be a strong antidote against contextual self-identification. Thus, the full experience of oneness induced by 5-MeO-DMT-like compounds was used to kick-start a profound transformation. It planted a seed of conviction on the potential that comes with Open Individualism. The power of union with the absolute bestows a glimpse of a fully realized world in which all beings recognize themselves as part of the same eternal luminous non-flavor. In turn, this solves many game-theoretical problems related to cooperation. One can finally conceive of a God’s-eye-view utility function for the entire universe. This experience is the maximum possible qualia synchrony level before memory stops working, and is often described as peak bliss in the human organism. Typically, the realization would be forgotten. The state-dependence of memory is often responsible for an associative disconnection between one’s sober self and one’s mystical recollections. Nevertheless, these experiences remain in the background, ready to reappear when the pieces of the puzzle (one’s mind’s I, and its self awareness) are aligned just right. The deathless state is one memory away. The experience kindles very deep properties of one’s consciousness which are close to the lowest level of resolution possible. On its own, the experience of oneness makes people happy for many years, on average. In a minority it backfires with a spiritual-philosophical crisis several decades later. But on the whole, people tend to feel grateful for the experience, and the gratefulness is carried over into the rest of their lives. Propositional qualia is the experiential modality that compares counterfactuals using symbolic manipulation techniques. On its own it cannot lead to reinterpretations of ontological notions. However, the state-space that it spans is very large and contains remarkable structures. More so, the returns on the exploration of the state-space can be boosted by using Bayesian search. The logico-linguistic algorithms of human thought are not trivial computations; the true generality of the medium is hard to appreciate. But Turings truly understand the astronomical generality of symbolic systems. Even bare bones of instructions can reconstruct any discrete pattern you can conceive of. The symbolic mind is capable of recursion and commentary. It learns from comparing gestalts of experience. So, what if we could compare, side by side, the experience of oneness with one’s everyday ontological notions? Traditionally, 5MeO-like experiences are interpreted as graceful glimpses of a broader reality. Their subjective quality is never fully remembered, and one simply takes what one can from it. Bienavi Institute decided to investigate whether it is possible to fully integrate the experience of universal oneness into one’s conceptual landscapes. For this reason, they focused on creating experiential bridges between sober states and pure oneness. It is well known that THC experiences are modified substantially after experimenting with a classical psychedelic. The high is different: more psychedelic, emotional, visual, deeply conceptual. A less well-known fact is that fresh peak experiences can profoundly affect how one experiences the classical psychedelic state. The Frame Stacking Model presumes that hallucinogens enable a perceptual frame buffer that allows for sorting and browsing through multiple simultaneous linear frames; or that frame perception might be splintered into a radial kaleidoscope of multi-threaded parallel processing frames (Fig. 6). Within the context of frame stacking psychedelic consciousness may enable the subject to scroll back and forth in time; retrieve multiple simultaneous memories from a single stimulus; and project multiple versions of the self into multiple imaginary future scenarios. If the consciousness of a single person can be momentarily realized within three frames – the arising frame, the fading frame, and a static frame which holds the idealized concept of self – then the persistence of six or more frames could lead to the fabrication of two or more fully realized identities within a single subject. This frame splitting effect may explain how people can have conversations with phantom friends or relatives, or how a shaman might invoke anthropomorphized plant spirits with distinct personalities. Thus, LSD-like states allow the global binding of otherwise incompatible schemas by softening the degree to which neighborhood constraints are enforced. The entire experience becomes a sort of chaotic superposition of locally bound islands that can, each in its own way, tell sensory-linguistic stories in parallel about the unique origin and contribution of their corresponding gestalts to the narrative of the self. This phenomenon forces, as it were, the onset of cognitive dissonance between incompatible schemas that would otherwise evade mutual contact. On the bright side, it also allows mutual resonance between parts that agree with each other. The global inconsistencies are explored and minimized. One’s mind can become a glorious consensus. Each square represents, and carries with it, the information of a previously experienced cognitive gestalt (situational memories, ideas, convictions, etc.). Some gestalts never come up together naturally. The LSD-like state allows their side-by-side comparison. In therapy, LSD-like states had been used for many decades in order to integrate disparate parts of one’s personality into a (more) coherent and integrated lifeworld. But scientists at the beginning didn’t know why this worked. The Turing module then discovered that the kaleidoscopic world of acid can be compared to raising the temperature within an Ising model. If different gestalts imply a variety of semantic-affective constraints, kaleidoscopic Frame Stacking has the formal effect of expanding the region of one’s mind that is taken into consideration for global consistency at any given point in time. The local constraints become more loose, giving global constraints the upper hand. The degree of psychedelia is approximately proportional to the temperature of the model, and when you let it cool, the grand pattern is somewhat different. It is more stable; one arrives at a more globally consistent state. Your semantic-affective constraints are, on the whole, better satisfied. The Turings called this phenomenon qualia annealing. Ising Model – A simple computational analogy for the LSD-induced global constraint satisfaction facilitation. LSD-like states were used to help the logico-linguistic mind develop a shared sensory-symbolic system with the 5-MeO gestalt. Known for thousands of years in the Amazon, the simple fact that the sober mind is incapable of grasping the essential learnings from the 5-MeO experience has invited frustration in those who have seen the potential for this state to change the world. With the aid of LSD-like states’ kaleidoscopic fragmentation, the 5-MeO experience could now be integrated into the mental programs of everyday life. Myriad previous states of consciousness are recollected, projected synesthetically into one’s experiential field, and reinterpreted in the context of a wider evidential base. Distinct states that linear mind would never think about comparing are presented together. Their sensorial, intentional and ontological quality become mutually transparent. The mind becomes a combinatorial laboratory. With sufficient conscious control one can navigate towards high-learning areas. By allowing states of consciousness to be compared side by side, the participants are able to create a scale of preference for each particular state. The results were robust. People chose unity again and again, although it certainly frightened some. The first outlines of a Total Order of Consciousness. A middle ground is developed. One produces an exegesis of the epiphany, a narrative of the meta-narrative; the ontological terra incognita finally has a voice to make proclamations with. The end result is that the mind integrates components of the 5-MeO experience into a meta-narrative. One becomes capable of interpreting reality both from an implicit Closed Individualist as well as an Open Individualist point of view. The Shulgins discovered a safe protein with MDMA-like psychoactivity. The inventor, to honor the research center that allowed her to make the discovery, named the protein Bienavi. This is when the final experiential bridge came online. The bridge from oneness to the full generality of symbolic processing could be made by LSD-like experiences. But to connect these intellectual learnings to an everyday-like sense of emotional presence, an entactogenic hedonic recalibration was necessary. Bienavi allowed these scientists to unleash the compassion known by their intellect into the vagaries of normal life. They described a sense of being one with universal love in everyday life. Some called it the marriage of the mundane and the sublime. From the point of view of a person on Bienavi, awakening every being alive was a thought that caused a profound sense of transcendental joy. Oh! The immeasurable vastness of the one flavor of knowing! Done in this highly systematic way, the researchers did not develop delusions of reference, nor believed themselves to be Messiahs. The long, gradual, methodical process spanning extensive preparation, 5-MeO, LSD and finally Bienavi, culminated in radical readjustments to the participant’s reward architecture. The final empathetic blow tended to have a robust effect of increasing self-honesty, which in turn protected against delusions of all kinds. Some would say that Bienavi translated the qualia integrated with the kaleidoscope into a human readable form. Suddenly, psychedelic researchers were not seen as awkward humans who happened to claim there is a sense in which we all could be one. Instead, they were now perceived as a group of people who embraced oneness at an emotional level, without having to sacrifice any epistemological rigor. Bienavi has a much slower onset of action and a longer duration of effects when compared to its quaint neurotoxic grandfather. Over the course of several weeks, a little seed of beauty slowly works its way up into larger-than-life experiences. On the third day of taking Bienavi, people become aware of the phenomenology of transparency. They notice the prevalence of windows, glasses, mirrors, and diaphanous objects in their cities. After five days, this gives rise to a palpable sense of space. Between you and your surroundings you now see, with clarity, a luminous spaciousness. You can’t believe how much bigger you’ve become, to put it one way. But the reality is that the proportion between every region remains the same. What’s different is that now your lifeworld has a much higher phenomenal density. By the second week space emits a warm rainbow glow, though this does not sacrifice the spatial resolution. You can’t believe how much information can fit in the perception of an apple. Your love towards all beings is not something you particularly question. It is self-evident from your vantage point that the reality of your current experience is founded on the same ontological ground as the suffering of your fellow beings in the multiverse. On Bienavi the mean hedonic tone is vastly higher than what a typical human experiences. Likewise, compassion and free kindness is outpouring in comparison. Every stimuli experienced is a delight; and yet, the light of love towards all sentients shines as in no other state. With neuroplasticity peptides, Bienavi can be fixed in place. Additional DNA therapy can be incorporated to help the cells regenerate any lost Bienavi over the long term. Researchers can maintain the entactogen state indefinitely. Since the Bienavi + neuroplasticity-peptide treatment is highly targeted to the protein complexes most associated with consciousness, it has near-imperceptible effects on other areas of the body. Life-long bliss was found to extend life. When Bienavi-assisted Oneness Therapy was perfected, it became possible to distribute all-in-one pills that made you invincibly happy over the course of several years. This pill was humorously named The One. The capsules contain a precisely dosed, carefully time-released sequence of proteins that become attached to the the cytoskeleton of one’s thalamic neurons. Rather than a dramatic experience of oneness, the perfected therapy induces a mild degree of neuroplasticity targeted to one’s current development area. One either improves one’s acquaintance with the oneness experience, furthers one’s understanding of oneness intellectually (via the kaleidoscope technique), or integrates one’s intellectual recognition of oneness into one’s everyday life. The pill releases proteins for each of these purposes, one at a time, over the course of a year. Once a cycle is done, the next begins. These cycles are very subtle, and they are not disruptive to one’s daily duties. They do, however, gradually increase both the depth and authenticity of one’s sense of connection to the universe. The result was a slow but steady upward spiraling towards a fully compassionate state of functional rapture. The change was fast enough to attract the attention of people who wanted to feel better quickly, but it was also slow enough that people felt comfortable with the gradual psychological transformations. The gradual nature dissuaded any early worry about its long-term effects, and its long-term effects made people eager to continue the treatment. At first, The One was a social oddity. The power of human cooperation, however, was not to be underestimated. Given the consistent and enduring economic advantages of a cooperative mindset across borders, it quickly became obvious that the only way to stay economically viable was to promote The One among one’s compatriots. The world, it turns out, experienced a virtuous arms race towards the glorious period of Open Individualism Manifest. A “psychological criterion” Closed Individualist and an Open Individualist go into a bar. The bartender is an Empty Individualist. Open: “Oh, that’s nothing of the sort! You use a little thread’s quirks and mistakes to judged the nature of the light that be! “All phenomena are impermanent, yes. But look, this impermanence happens at the level of our experience. In reality, all of the karmic links that unite the web of life are a web of 4-dimensional qualia wavelets. I.e. pieces of self-existing qualia crystals from eternity interlinked in a way that minimizes the energy of the configuration. “Of course, natural selection has recruited brains that allow the mutual coexistence of qualia crystals with competing alignments and often contradictory 4D unfolding that interfere badly with each other. If it weren’t for the interference of perfect forms with each other that are rendered possible by the quantum properties of the human brain and its oversoul connection, hedonic tone would always be positive. In fact, hedonic tone is just the awareness and surprise of existing. Except that such awareness and surprise gets distracted and therefore, ‘poorly unfolded’ when a person tries to think a beautiful thought. Open: “You are the boundary of your world. You are the entirety of the universe ‘acting’ -which amounts to managing qualia forces- in the precise time and place that you inhabit.” – Open was standing on the chair, with a finger pointing towards the sky. Well, the ceiling, which wasn’t very clean, since the bartender didn’t want to create time-slices-beings whose sole purpose was that of cleaning a dirty ceiling. He was, clearly, fanatical. Conjuring Wish Substance out of the air. Inspired by: David Pearce, Daniel Kolak, Derek Parfit, Buddha, and Krishna. Peace be upon the emptiness. Ever noticed implicit geometries in the structure of the qualia you deal with on a daily basis? So here is one observation about our experience. Visual experience has two major dimensions and one minor one (depth). This sensory modality is experienced as either 2 or 3 dimensional (and ambiguous points in between are also instantiated at times). Now, it also has a specific kind of topological features. It seems that the edges of the visual field are the edges of a patch in Euclidean space. The edges are not connected to each other. At first, it might take you by surprise to consider hypothetical visual fields with edges that are actually connected. 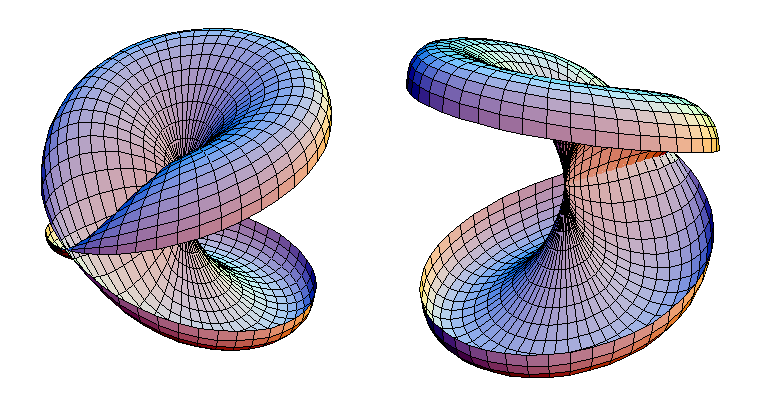 Maybe you could make it a torus, by connecting edges left and right as well as those at the top and the bottom of the visual field. It’ll make a manifold of experience. You may also twist it before connecting it, making a Klein bottle or a projective plane. Real Projective Plane. Imagine your visual field connected to itself in this way by twisting and joining the edges. A common reaction to this idea is “it may be impossible to do that, maybe the geometry of our visual field is the only possible one.” Without actually going ahead and interfering with your mind and brain directly it is unlikely I’ll be able to show conclusively it is possible. But there is a strong intuition pump available to help you conceive of the possibility. So, touch your arm. Your writs more specifically. Using a finger make a circle around the wrist. You end up where you started, and yet you only advanced in one direction.